This round Bento Box is ideal for taking a waste free 'on-the-go' balanced lunch from home. 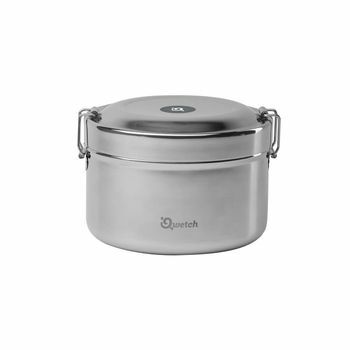 It is constructed from two layers of unlined food grade stainless steel and is designed to keep contents warm for up to 4 hours and cold up to 6 hours. Inside the box has a separate removable compartment which has a handy silicone seal around the outside for an easy, snug fit. 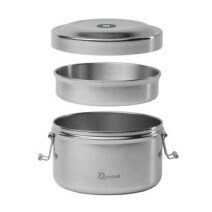 The stainless steel lid also has a silicone seal on the inside and locking clips at each end. An ideal container for taking chilled savoury salad or pasta, plus fruit or a snack to work in one neat container. 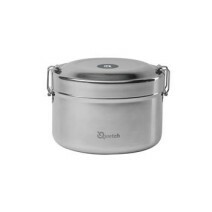 It is also suitable for taking hot food, though we advise it will only keep contents warm for up to 4 hours. To prevent spills and leakage, fully tighten the lid to ensure an airtight seal. Transporting upright is recommended. Please note that although this container is suitable for wetter foods such as dressed salad or dips it is not designed for liquid foods such as soups and broths. Made responsibly in China from high quality 18/8 (304) food grade stainless steel. Free from BPA, phthalates and lead. Not for use in microwave, dishwasher, freezer or oven. The silicone seal is removable and can be washed separately, then reinserted, flat side down. Approximate overall dimensions: 9.5cm high x 14cm diameter - 850ml. Inside compartment measures approximately 3cm high x 13.5cm diameter.